The main argument for a universal basic income (UBI) is that it would reduce poverty and income inequality. Yet UBI advocates often overlook a range of other potential benefits. Digital UBI payments can bring people into the financial system and build their financial capability, unlocking a range of development benefits for citizens and governments alike. Take Mongolia for example. In 2014, 92 percent of adults had a bank account—by far the highest share in the developing world. (By comparison, only 43 percent of adults are banked in similar lower-middle income countries.) Young adults, a population often financially disenfranchised, see some of the most impressive usage of financial services; account ownership among Mongolians aged 15-24 years old is 93 percent. Smart policies, digital payments, and greater inclusion of traditionally marginalized groups all helped Mongolia achieve nearly universal account ownership. The Mongolian Human Development Fund (HDF) distributes revenues from the mineral and mining sectors with the objective of redistributing wealth. A flagship program funded by the HDF is the Child Money Program (CMP), launched in 2012. As part of CMP, the government makes monthly electronic deposits into savings accounts opened in children’s names, helping to ensure that all Mongolians will eventually be banked. The program pays about $10 a month to all children aged 0 to 17, thus ensuring that the parents of every newborn open an account in their child’s name. Alongside South Africa, Mongolia has one of the developing world’s largest shares of adults receiving government transfers—35 percent—with two-thirds of these payments made directly into bank accounts. Seventy percent of account owners in Mongolia make or receive any payment through their account, while in East Asia and the Pacific as a whole the share is 50 percent. These accounts aren’t only passively utilized to receive payments—they are also actively used for monthly cash management and longer-term savings. The percentage of account owners in Mongolia who make three or more withdrawals in a typical month is three times larger than the regional average. Over 30 percent of adults use an account to save. We can tell a similar story in Iran, where 92 percent of adults are banked (compared to 15 percent in the Middle East on average) and over 60 percent of adults receive a government payment into their account. In 2010, the government replaced energy price subsidies with household energy dividend transfers. Since money was paid exclusively into accounts, an estimated 16 million new accounts were opened to ensure every eligible family could receive benefits. The ATM network was also expanded to allow Iran’s rural population access to their accounts. Impressively, 41 percent of adults in Mongolia gave correct answers to 4 out of 5 questions on basic financial literacy topics (inflation, interest compounding, discounting, and interest numeracy), as compared to 28 percent of adults in China. This is at least suggestive that growing up with an account, receiving regular payments into that account—and watching the savings grow over your childhood—improves familiarity with financial products and financial capability. Using bank accounts, instead of dispensing cash through a network of regional and local governments, offers many additional advantages: First, it’s cheaper—for both the governments and households. A rigorous evaluation of a social transfer program in Niger has shown that the variable cost of administering social transfers is 20 percent lower by electronic transfer than by manual cash distribution. Second, bank accounts offer a safer way for the government to distribute large amounts of money, compared to recipients walking home with wads of cash in their pockets. This concern is especially salient for regular cash payments, such as UBI payments, that are received at publicly known points in time and space. Third, the liquidity and transactional anonymity of cash payments make them subject to “leakage” (payments that do not reach the recipient in full) and to “ghost” recipients, particularly in the context of government transfers. The electronic payment process, which generally requires more stringent identification documentation, makes it easier to trace payments and harder for ghost recipients to remain undetected. Fourth, digitizing government payments is a proven way to expand financial access and often the first entry point into the financial system for unbanked individuals. Electronic distribution of social benefits offers recipients an opportunity to open accounts for savings and payments and build transaction histories, which can improve their credit access. In India, a government program has opened over 250 million bank accounts in the past four years, along with close to 1 billion biometric “Aadhaar” identification numbers. The current government has moved toward reimbursing poor people on their purchases of basic goods with money paid directly into their bank accounts. With the banking infrastructure in place for electronic payments, the government of India in its most recent “Economic Survey” flirted with the idea of electronic UBI payments. Ultimately, there’s a symbiotic relationship between electronic universal basic income payments and broader financial inclusion. 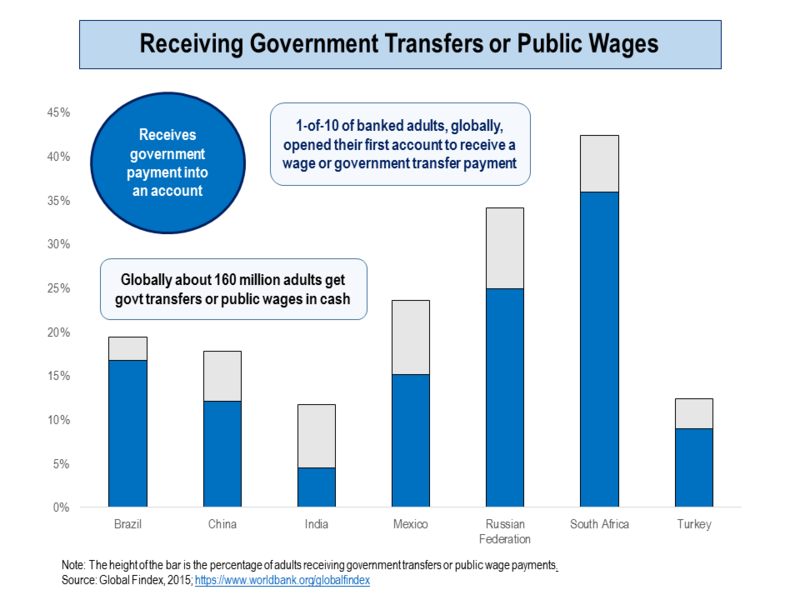 Electronic UBI payments can bring unbanked adults into the formal financial sector; greater financial inclusion can lay the groundwork for the introduction of more efficient government payments. This piece was originally published on the Brookings Institution's Future Development blog.